Hanli & Julia are super excited to bring together their diverse worlds and experiences to offer the first ever I AM WATER / Resilience In Action marine adventure weekend for YGLs. Following directly after the YGL ANNUAL SUMMIT in San Francisco - this Learning Journey will allow you the time to connect more with fellow YGLs and make the most of your time on the West Coast. I AM WATER Ocean Travel offers intimate wildlife encounters with the ocean’s most majestic creatures from dolphins to seals, humpback whales and manta rays to hammerhead and whale sharks to name a few. The team consists of world class freedivers and marine experts who will take you on a once in-a-lifetime journey into the ocean mind, body and spirit. Combining yoga, deep freediving training and pristine wilderness locations we offer you a slice of a life away from the every day. Resilience in Action pairs deep inquiry with conceptual frameworks, insights and practical tools that enable leaders to thrive and catalyze transformative change in the contemporary world. Distilling insights about resilience from disciplines as diverse as ecology, psychology and military strategy and translating these insights into action, working with partners to understand and adopt core orientations that foster resilience. I AM WATER is at its core an ocean conservation organization. Not only do we adhere to the highest standards of responsible marine megafauna interaction, but through I AM WATER Ocean Travel we generate funds to support the projects of the I AM WATER Ocean Conservation Foundation. WHALE SHARKS are the largest cartilagenous fish in the sea. They are gentle filter-feeders, feeding on tiny plankton while migrating around the great oceans, sadly they are listed as endangered globally. There are several places in the world where one can swim with whale sharks and we have picked La Paz not only for its proximity to Espiritu Santo Island, but also because we support the work of the local operators with regards to sustainable interactions with these precious and threatened animals. We will be diving with a top Mexican researcher, Dr Deni Ramirez and her team. FISH TORNADOES... on the Eastern Cape of Mexico’s Baja Peninsula, is one of the world’s most successful marine protection areas. As the northern most reef in the Eastern Pacific, this area of ocean in the Sea of Cortes was set aside for conservation after community leaders convinced the Mexican government to protect the unique reef ecosystem & the incredible biodiversity of the region. After more than twenty years of protection this ecosystem abounds with life. Most notably massive schools of jackfish fill the ocean 20 meters deep and hundreds of meters long. Our days at sea will be hosted by the Castro Family, Mario Castro being the man who started the move from fishing to protection all those years ago. His son David is our skipper as we head to sea to find the fish he has dedicated his life to protecting. On numerous occassions this unassuming young man has stopped the boat abruptly in the middle of vast blue ocean and said ‘ They are here. Under us. I can smell them...’ We are excited to share this bond with the sea with our participants, and as we deepen our freediving practice & resilience work - feel that connection grow in ourselves. OTHER than the majestic SCHOOLS OF JACKFISH and great WHALE SHARKS you will meet, there is an abundance of REEFS to be explored along the coastline - known for the diversity of brightly coloured fish and this northern - most coral reef system. We will also get the chance to meet the playful SEA LIONS who spend their days lazing on the rocks or do aquatic acrobatics in the water... our very own puppies of the sea! With an average water temperature of approximately 80°F (27 °C), you will be able to spend plenty of time in and underwater. Arrive at Hacienda around 3pm - welcome, ocean swim & settle in. Yoga & breath work session, introduction to resilience journey followed by an early dinner. 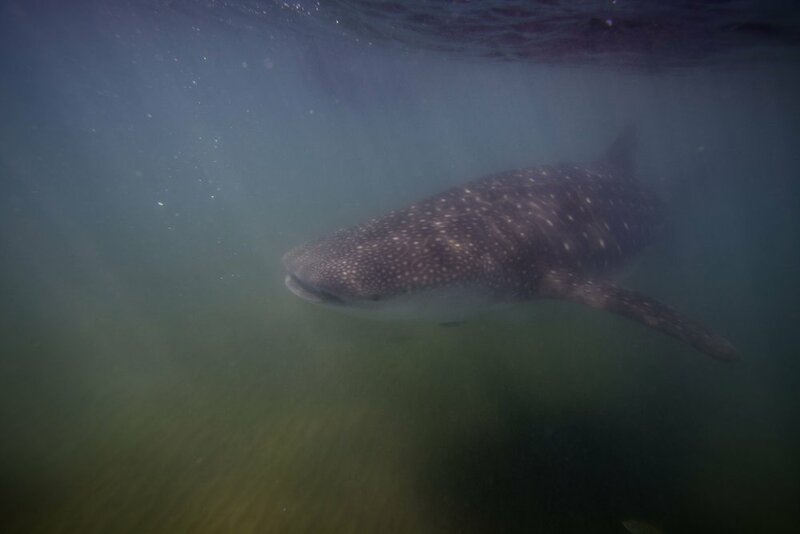 Morning freediving session off La Paz, followed by a couple of hours with the incredible whale sharks. Practice freediving alongside the oceans largest fish and boat based resilience sessions looking at three transformative leadership orientations to increase resilience and capacity to lead change. Lunch back at the Hacienda and relaxing afternoon, sunset yoga and early dinner. Early morning drive through the majestic Baja desert to a sunrise boat launch to see the majestic schools of jack fish around the Cabo Pulmo Marine Reserve followed by deep freediving training & boat based resilience session. Lunch in Cabo Pulmo followed by another boat launch & afternoon snorkel with ocean exploration and freediving training. Travel back to the Hacienda and a yoga session at sunset followed by our final dinner on the beach. One last sunrise session exploring our local cove followed by breakfast, long beach walks, final group conversations and wrap up. Lunch and travel home. Please note: All of our days follow a rhythm conducive to optimal freediving, yoga and relaxation experiences. However, we will have a weather dependent schedule as the wind and swell will be decisive for which of our dives we do every day.. Moreover all our actions are guided by the highest standards of responsible marine megafauna interaction. The animals’ wellbeing is our top priority at any time. Should we or our expert guides get the impression that our presence (in and out of water) stresses or disturbs the animals, we will distance ourselves instantly even if this might limit our interactions. Freediving is an age-old practice of exploring the ocean on one breath. With its roots in subsistence living off the sea, freediving has become a competitive sport with disciplines, competitions and records and moreover, one of the biggest expanding water-sports in the world. In contrast to scuba, freediving is the most natural way of being underwater, enabling you to get much closer to the animals – particularly the bigger ones – while having the least ecosystem impact. Furthermore, it is more athletic than scuba and allows you to move faster and more freely (in all directions). Learning from a good instructor, the art of freediving is simple and is a tool to explore your body’s (aquatic) ability, the physiology of the human body underwater with the impressive mammalian dive response we share with whales, dolphins and seals. At I AM WATER Ocean Travel, we teach a conservative slow progression approach where you will explore your limitations and capabilities under the expert eye of top certified freediving instructors. Each day will start or end with a yoga session to prepare your lungs and body for deep breaths and time underwater, learning to control your breathing and to slow your heart-rate. You will be offered breath-hold training on land, in water as well as deep diving sessions along a rope to prepare you for meeting the animals. As world-class freedivers we will inspire you to explore your own depths! None of our trips require more than a general interest in the ocean and its creatures, basic swimming abilities and good health. It is open to all ages and fitness levels (medical questionnaires will be required). For further information please check our Freediving FAQ's. Setting the stage for our weekend of ocean wildlife encounters, internal journeying, yoga and incredible food we will be staying at two private beach haciendas just south of La Paz in the beautiful Bahia de los Suenos Bay where the oranges of the desert mountains meet the turquoise waters of the Sea of Cortez. The Haciendas have 10 en suite rooms in total which allows for a maximum group size of 14 participants sharing.and the team. While we encourage participants to disconnect from the world of emails, we also understand the need to connect / Wi-Fi access is available in the hacienda’s common area. Your private beach for the week is only steps away. After your ocean time, a dip in the pool is waiting to rinse away the salt and cool you down. Our local chef will specially prepare a menu of high quality nutrient rich food, delicious and nourishing with a strong local Mexican flavour. Our group will be split between two adjacent beach haciendas built in the traditional Mexican ranch style. With cool tiles throughout, warm wooden furniture and rustic barefoot comfort, the haciendas have incredible ocean views and private pools and are right on the beach. Some rooms are double beds and some are two singles, all rooms will be for two people sharing. Let us know your preference when you book, whether you are traveling alone and want to share a twin with a fellow YGL, or traveling with a partner and wanting a double bed. This YGL Bespoke Trip / Learning Journey will be for adults only and is max 14 participants and exclusive to YGLs and their partners. . We hope to in the near future host our YGL friends and families on a week long ocean adventure! Friday 19 October: We recommend an early flight from San Francisco to San Jose del Cabo (SJD) on Friday morning. We will aim to depart the airport together around 2pm latest. There are numerous direct flights between San Francisco and San Jose del Cabo, and the flight time is only 3 hours. Guided animal encounters with Hanli and Peter. Three nights accommodation in comfortable oceanfront Haciendas. Dear YGL friends, we can’t wait to welcome you to beautiful Baja and share our oceans and freediving with you! Here are some details for you to read through, let us know if there’s anything you need help with in preparation for your trip. The water temperature in Baja in November is lovely and warm, between 77 – 80 F (25 - 27ªC); so a wetsuit is optional, as we tend to slow down our heart-rate significantly in freediving, you might feel the cold despite the warm air temp and comfortable water temp. We will supply you with rash guards/ swim shirts that you can wear over your swimwear for extra sun protection and if you do tend to get cold quickly, please bring a wetsuit or let us know and we can organise on location. Please boost up on Vit C and keep the dairy intake on a low down the weeks before so your sinuses and ears aren’t congested while we’re there. Most of our diving days will start with an hour or so of freediving training along a rope, technique, equalisation etc. then a couple of hours of diving with the whale sharks, jackfish, sea lions and exploring the marine environment. Yoga is an important part of freediving practice, and we will be offering fun and dynamic daily mixes of Vinyasa Flow, Hatha and Yin Yoga, depending on our energy levels and the weather. Wear yoga clothing that allows you to move and feel comfortable. Yoga clothing can be loose cotton apparel or more gym-like stretchy… whatever suits you! Please let us know if you have any injuries so that we can guide you through modifications prior to practice. By the same token, if you have any special interests also let us know. If you are new to yoga, don’t worry! We will offer sessions that can challenge the experienced but give options for the beginners. Our group will be split between two adjacent beach haciendas built in the traditional Mexican ranch style. With cool tiles throughout, warm wooden furniture and rustic barefoot comfort, the haciendas have incredible ocean views and private pools and are right on the beach. Some rooms are double beds and some are two singles, all rooms will be for two people sharing. Let us know your preference when you book, whether you are traveling alone and want to share a twin with a fellow YGL, or traveling with a partner and wanting a double bed. The hacienda comes with a wonderful Mexican private chef and her food has a delicious Mexican flavour! We will have time during our week together to talk about ocean friendly diet and other ocean challenges and decisions. *Let us know if you have any further dietary requirements or concerns. October is a great month in Baja! Not many people as it is after the summer rush, but with all the animals moving into the area. And even though it’s late summer in the northern hemisphere, it’s still warm and pleasant during the day but comfortably cool in the evenings - Baja sometimes looks like a desert (which it is!) and sometimes after rain it is lush and green - October can be either of these! Some days may get a little windy so do bring a light wind jacket and some warmer layers for the boat and morning/ evening yoga. Due to the diversity and remoteness of our destinations, I AM WATER Ocean Travel does not offer insurance nor take responsibility for insurances on these trips - you will be signing liability release forms upon arrival so please do make sure your travel insurance is in order. As all our diving will be recreational most insurance providers should cover your trip, or if travel insurance is included in your health insurance make sure Mexico is listed - please don’t hesitate to reach out to us if you have questions regarding this. Wetsuit (surf or relatively thin and flexible scuba suit if you tend to get cold easily. Camera or GoPro if you enjoy taking pictures - but we will have both our camera and GoPro and will be documenting all the activities so you can don’t need to think about this unless you enjoy taking photos / videos. We will be sharing all the images and some video with you after the trip. A thin sarong - always a good thing to have on the boat and after. Happy planning and please get in touch anytime if you need more info or have any queries! Casa Natalia: In the heart of old town San Jose just off the central square is our favourite local boutique hotel in San Jose del Cabo. This 19 room villa style hotel is well situated in the middle of San Jose del Cabo’s art district, and many of the town’s best eateries are a short walk away. Besides its location, our favourite part of the hotel is their pool and comfy hammocks that line the lower portion of their sunbathing deck. Some shaded reading in the poolside hammocks is a highly recommended siesta location! Cabo Surf Hotel: This hotel has had a major upgrade in the last couple years. It used to be a slow paced surf shack close to the local surf break, “Old Man’s”, but its recent renovations make it a luxury surf and beach retreat just off the Mexican Highway 1. The oceanfront dining area is great for a marguerita after a day of surfing “Old Mans” with one of the hotel’s surf instructors. It is close to the old town San Jose del Cabo but will require a car or taxi to make that trip. If you would like a chance to learn to surf before or after the trip we highly recommend this accommodation and its surf instructors. Villa del Faro: This is one of our favorites if you can find a room available and have the time to detour to the Eastern Cape. We enjoy the seclusion and quiet of this deserted portion of the Eastern Cape. The villas were built by a family from the Los Angeles area that owned a construction company. They originally built the villa for their family and their children’s families. As the family grew the grounds of the villa did as well, and when the family stopped visiting the hotel as often the villa transitioned into an eco-hotel. There are 5-6 spacious suites with living areas both indoor and out and decorated in typical Mexican style. The food isn’t fancy but there is a nice little restaurant where the owners and their local Mexican staff cook for guests. It is off the beaten track on mostly dirt roads, but there is no need for a heavy duty vehicle to get there. As long as it’s not raining you will be fine. For any interested surfers, we will let you in on a little secret… there is a nice right hand point break when the south swell gets in here, and it’s only a short walk along the beach to the wave. You will need to rent a car to get to and from Villa del Faro, we recommend Cactus Car Rental at the airport. Enjoy!